The framed look adds substance to the quality and beauty of the CrystalLine By-Pass unit with its slim glass framing. The CrystalLine Framed By-Pass can be installed as a stand alone door or with panels. The sleek polished towel bar and extrusions complete the timeless look of the CrystalLine Framed By-Pass. The CrystalLine By-Pass is available in several standard sizes or can be customized to fit your opening. 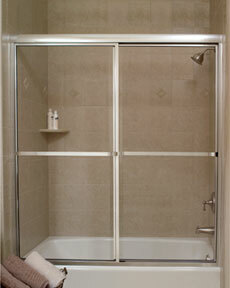 Framed Bypass Shower Door 57" to 59" x 65 1/2"
Framed Bypass Shower Door 41" to 43" x 68"
Framed Bypass Shower Door 43" to 45" x 68"
Framed Bypass Shower Door 45" to 47" x 68"
Framed Bypass Shower Door 47" to 49" x 68"
Framed Bypass Shower Door 49" to 51" x 68"
Framed Bypass Shower Door 51" to 53" x 68"
Framed Bypass Shower Door 53" to 55" x 68"
Framed Bypass Shower Door 55" to 57" x 68"
Framed Bypass Shower Door 57" to 59" x 68"
Framed Bypass Shower Door 59" to 61" x 68"
Framed Bypass Shower Door 61" to 63" x 68"
Framed Bypass Shower Door 43" to 45" x 71"
Framed Bypass Shower Door 45" to 47" x 71"
Framed Bypass Shower Door 47" to 49" x 71"
Framed Bypass Shower Door 49" to 51" x 71"
Framed Bypass Shower Door 51" to 53" x 71"
Framed Bypass Shower Door 53" to 55" x 71"
Framed Bypass Shower Door 55" to 57" x 71"
Framed Bypass Shower Door 57" to 59" x 71"
Framed Bypass Shower Door 59" to 61" x 71"
Framed Bypass Shower Door Openings 61" to 63" x 71"